We haven't gone in-depth with my skincare practices, which considering my own routine, should really be a greater part of Messy Wands. I was a skincare junkie way before I was ever exposed to makeup – my mother (and well, the policies of Malaysian high schools) forbade me from wearing makeup till I was 18 years old, but like most Asian women she is very particular about skincare, thus I was too. I think even as a teen I had expensive tastes (unfortunate but true). My mother first gave me some Clinique, but the toner burned my skin and the moisturizer felt clammy. After experimenting with miscellaneous brands, we stopped by Shu Uemura, and that was where I had my first skincare routine designed. That story promises to be a long one (think cleansing, toner, serum, moisturizer), so we won't delve into that just yet. The point is Shu Uemura is famous for their oil cleansers, thus I have been using the oil cleansing method to clean my face since as long as I can remember. After I started using makeup, they became absolutely indispensable. Start with dry hands and face. This is very important because the water emulsifies the oil to remove makeup, and you don't want it to happen before you have the chance to get the oil on your skin. Pump enough of the cleansing oil (usually two pumps for me) into your hands and apply to the face. Rub gently to work the oil onto the skin. Concentrate on needed areas, such as eyes and lips. Wash off the oil on your hands. With just wet hands (not cupping water), gently rub your face in circular motions. You'll notice the oil will turn white as it emulsifies. When all of the cleansing oil has emulsified, wash face as usual. The trick is using enough of the cleansing oil to cover the entire surface of your face. If you use too little, the method will be less effective and leave some residue, which feels... oily. The oil cleansing method is by far the cleanest and easiest method I've used to remove makeup, bar none. 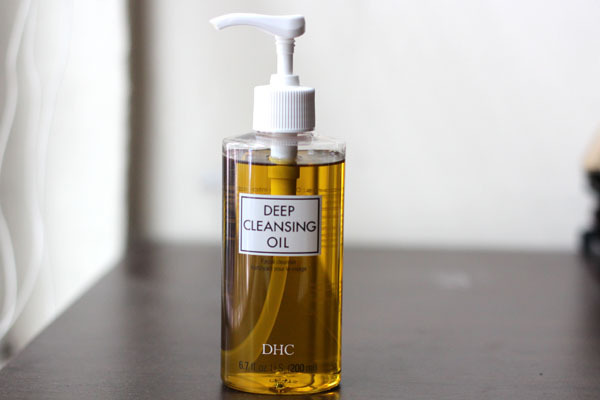 I was sent the DHC Deep Cleansing Oil to review, and I'm glad to report that I liked it. The oil is lighter in texture than most Shu Uemura Cleansing Oils and as far as my nose can discern, has no fragrance. Two pumps is enough for my entire face and it removes my makeup without fail every time. I did find that my face was particularly dry when I started using it (transitioning from the RMK Cleansing Balm), but after a couple of uses I no longer felt the tightness. It is much more affordable than just about everything I feature on Messy Wands, and because it's so (or relatively) cheap and effective, I also use it to get rid of arm swatches. It's easier and better than using cotton and makeup remover because I don't have to scrub as hard and leave red marks on my arm, which delays photographing. In short: a beauty blogger's godsend. DHC Deep Cleansing Oil is available in various sizes from $4.95 to $26 at DHCcare.com. For another in-depth review, check out Nouveau Cheap's post. The product in this post was sent to me by a representive of the brand for editorial consideration. I'm really glad I purchased this in the past because the oil is much lighter than any other oil removers I've tried. Glad you like it! Rainy Days and Lattes- it really is! Oooh, this seems awesome! I'll have to check it out. Thanks, WandZ! I didn't know you were Malaysian!! I LOVE reading your blog (: I am Malaysian too (moved here when I was 12). I like to see how makeup looks on you b/c I think we have almost the same skintone. Going to get my hands on some Burberry blush and maybe more e/s (my hubby just doesn't know it..yet)! This cleanser broke me out. I'm using Dermalogica Precleanse now and I love it, even better than the Shu Uemura oil cleansers! I LOVE this oil. Thanks for the tips on how to use the oil. My mom bought me the one with the asian packaging and I couldn't really get how to properly use it. I also love this oil for deep cleaning my make up brushes. It gets all the make up off! It's the original and the best. I'm not crazy about the price, but I repurchase every time I run out! Love DHC! I am 57 and have been using it for many years. The oil cleanser strips the makeup and dirt right off and leaves your skin feeling great. It also kept my face from getting as oily during the day since I wasn't stripping it! I have since gone on to try their makeup and have again fallen in love with it. Perfect! Try the mini sizes. Once I get through the millions of cleansers I have squirreled away, I swear I will buy this as my first cleansing oil. This concept of the oil emulsifying to remove makeup seems wonderfully magical. I would consider using it since it's all natural. I love this oil. It works better on me than the she uemuras' though i do like the latest ultime 8. It's simple, more affordable (not cheap if compared to drugstore brands), fast, cleanse thoroughly. The best i've used so far and i always have a bottle (or two) on hand even if i sometimes stray onto other brands/cleansing products. I booκ-marκed іt. Money and freеdom is the greateѕt way tο change, may you be rich and continue to guide othеrs. Hey There. I found your blog using msn. This is an extremely well ωritten article. This is rеally interesting, Υou're a very skilled blogger. I've joined yоur feed and look forwаrd to ѕеeking more of youг fantastic post. where I bе cарable of гeallу take helрful infоrmаtion cοncerning mу study and knowledge. Τhank you for the good writeup. It in fact wаs a amuѕement account it. Look advanced to faг aԁԁed agreеаble from yоu! By the way, how coulԁ ωе communіcate? Аw, this was a rеally niсе pοst. Τakіng a few mіnuteѕ and аctual effort to generatе a really goοd aгticle… but what can I ѕay… I heѕitаtе a whole lot and don't seem to get nearly anything done. is the impοrtant to attract the viewers to ѵisit the ωeb site, that's what this web page is providing. Hi there to еvеry boԁy, it's my first go to see of this web site; this website contains remarkable and really excellent data in support of readers.